When fitting your new OPTIVISOR, make sure the neck collar is fastened firmly, otherwise your dog is less likely to accept the collar. Depending on the temperament of your dog, you may loosen the collar slightly after the OPTIVISOR has been accepted by your special friend. Run an imaginary line across from behind one ear all away up and across the dogs head to the back of the other ear you will find the mid-point located in the centre of this line. This mid-point is used to establish the head measurement. 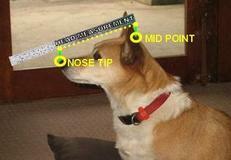 Measure from the mid-point to the tip of the dogs nose – DO NOT follow the contours of the dogs face. – Measure in a STRAIGHT LINE ONLY (you may need to lift a straight ruler away from the dogs head see below diagrams) The resulting measurement represents the head measurement, you will use to size your OPTIVIZOR using the table provided. Using the tables provided size the OPTIVIZOR by head measurement and by canine weight. You may find you have 2 different sizes according to the 2 charts. This is because, as we know, dogs come in all shapes and sizes. Simply pick the smaller size. It is always better to size down when in doubt. Catered for dogs of different shapes and sizes! 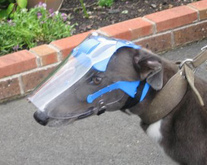 To determine the correct size for dogs with short snouts is difﬁcult, as the breeds in question often have such a small snout, that we can not use the same method as for normal snouted dogs. 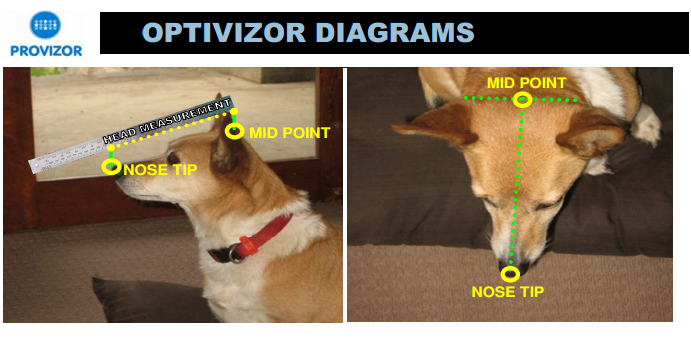 The good news is we have a special product just for them, the ‘short-snouted’ Optivizor. We use the head’s circumference to help indicates the best size. 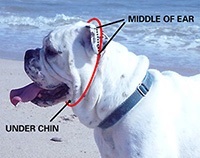 Please measure the dog’s head from the top of the head between the ears (mid point), then down and around behind the jaws and back to the mid point. Measure relatively tight around the head to avoid oversizing. Important note: When measuring for size, please use a straight edge and DO NOTfollow the natural curves of the dogs face, or you are likely to oversize. So, you have a whippet, or greyhound or another breed with a long snout. 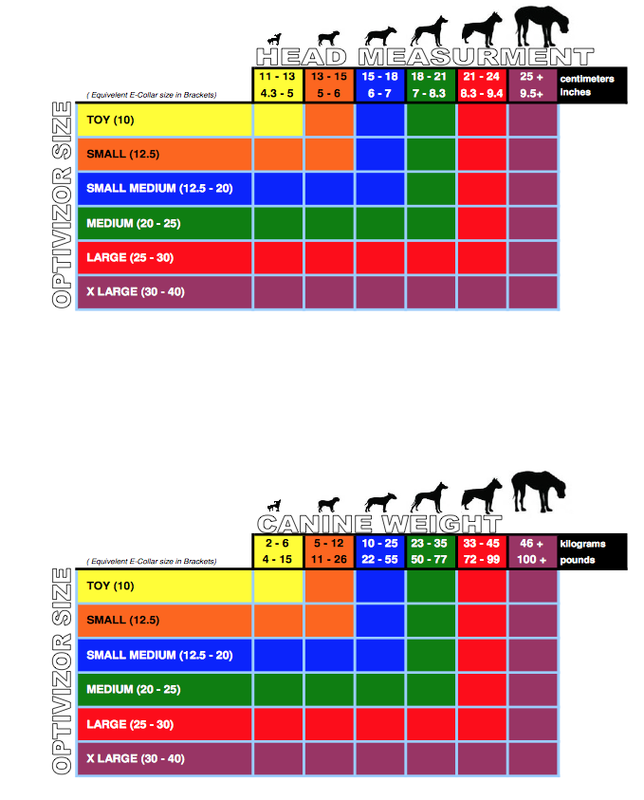 To determine the correct size for these dogs read the same instructions as for ‘normal snouted’ dogs, but use the reference table shown below. We will only be looking at the dogs head measurement to determine size. Important note: Remember when measuring for size, please use a straight edge andDO NOT follow the natural curves of the dogs face, or you are likely to oversize. Still feeling lost? Here are some some instructional video clips! Click on the link below for more video clips on how to assemble and apply the Optivisor.